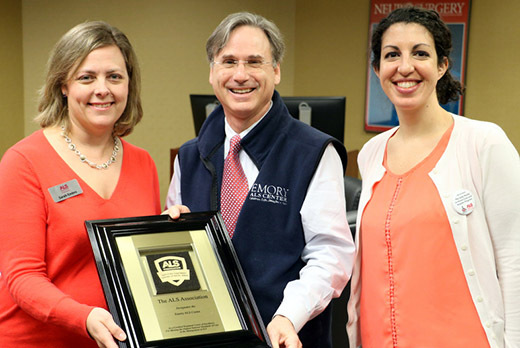 Today, The ALS Association recognized the Emory ALS Center as a Certified Treatment Center of Excellence. This designation establishes Emory as meeting the highest levels of established national standards of care in the management of amyotrophic lateral sclerosis (ALS), often referred to as Lou Gehrig's disease. ALS is a progressive neurodegenerative disease that affects nerve cells in the brain and the spinal cord. People with ALS lose the ability to initiate and control muscle movement, which often leads to total paralysis and death within two to five years of diagnosis. There is currently no cure for the disease. Since 1998, The ALS Association's national network of Certified Treatment Centers of Excellence has provided evidence-based, multidisciplinary ALS care and services in a supportive atmosphere with an emphasis on hope and quality of life. Each ALS clinic must meet The ALS Association's clinical care and treatment standards, which are based on the American Academy of Neurology (AAN) Practice Parameters, participate in ALS-related research and successfully complete a comprehensive site review to be certified as a Center of Excellence. Achieving certification through successful completion of the program's robust clinical and administrative reviews confirms to people living with ALS and their family members the validity and comprehensiveness of the Certified Treatment Center of Excellence's standards of quality and implementation of best practices. "We are delighted to have met the criteria for becoming a Certified Treatment Center of Excellence and are thankful for the continued support of the Georgia Chapter in helping provide the very best care for patients here in Georgia," says Jonathan Glass, MD, director of the Emory ALS Center. Research has shown that multidisciplinary care, or the practice of having physicians and other health care professionals collaborate to provide the most comprehensive treatment plan for patients, helps people with ALS have better quality of life and actually prolongs life in most cases. "The care that people receive at Emory is a model for other parts of the country, and I'm proud that we are able to recognize the institution for its outstanding multidisciplinary approach to treating people with this devastating disease," says Sarah Embro, executive director of The ALS Association Georgia Chapter. The Emory ALS Center is dedicated to performing cutting edge research while providing comprehensive care for people and families with ALS and related motor neuron diseases. The center is one of the largest clinical centers for ALS care in the United States. For more information about ALS care and research at Emory, please visit www.neurology.emory.edu/ALS/. The ALS Association is the only national non-profit organization fighting ALS on every front. By leading the way in global research, providing assistance for people living with ALS through a nationwide network of chapters, coordinating multidisciplinary care through certified and recognized treatment centers, and fostering government partnerships, The ALS Association builds hope and enhances quality of life while aggressively searching for new treatments and a cure. For more information about The ALS Association Georgia Chapter, visit our website at www.alsaga.org.